Remove fish stink from your hands and leave your hands smelling fine, not fishy. Works two ways: Odor neutralization and odor counteraction at the molecular level. No other wipes can do this! 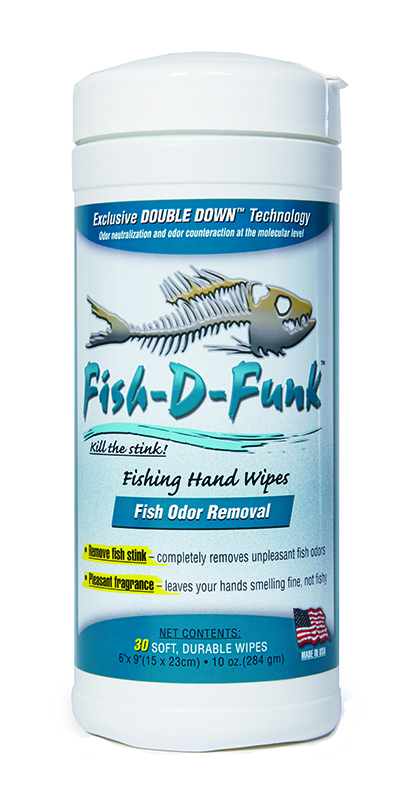 Fish-D-Funk Oror Removal Wipes remove fish stink from your hands and leave your hands smelling fine, not fishy. Great product. I keep a container in my boat. When I need to clean off my hands I just grab a sheet from the container wipe my hands down and go back to fishing. It dries quick and leaves your hands feeling clean. These work great, plan on trying some of the other wipes as well.